【3 LED SOLAR LIGHT】 Newest 3 led solar light emits bright light, not only an ideal decorative light, but also lighting at night to improve the safety of people and property. 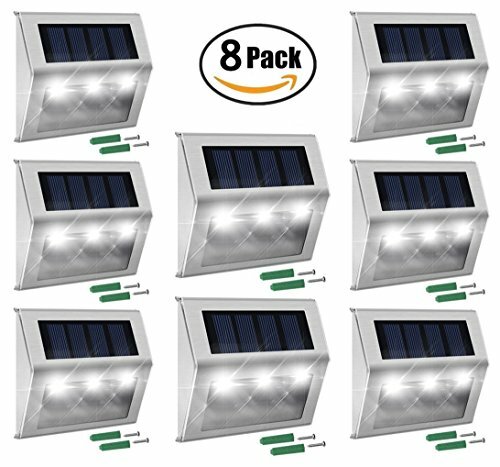 【NEWEST SOLAR PANEL】 Solar deck light come with advanced solar panel, charging efficiency is higher than the old solar panel, make sure it can keep lighting normal when can not get enough sunlight some days. 【AUTO ON / OFF】 Solar step light with automatic light sensor function, the solar stair light automatically ON at night and OFF during day. Work times up to 9 hours at night when it is full charge. 【WIDELY USED】 This palm-Sized light very easy to installation, no unsightly wires required, can be fix with 2 screws or double-side adhesive, perfect for stairs, paths, walls, fence, decks, garden.